After a couple of longer than expected travel days we crossed into Texas. We didn’t add state stickers on our map though for Wyoming or Colorado and I wanted to talk about that for just a minute. 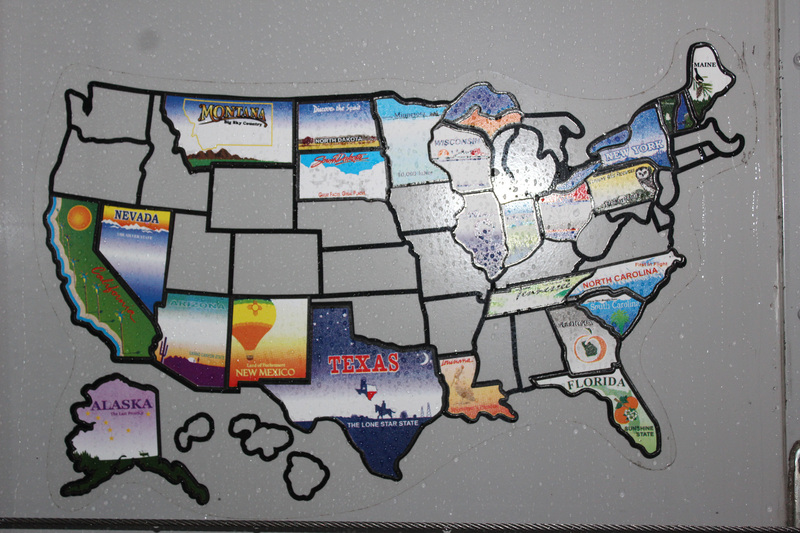 Deciding when you will put a state sticker on your map is a VERY important decision. Many people place the sticker when their wheel hits the state (and there is absolutely nothing wrong with that), but after we polled some people on the RV-Dreams Forum (my favorite answer was “my dog has to poop in the state”) we decided that we would both have to see something specific to the state for it to count. So since we blew through Wyoming and Colorado (we were tempted by Norad to count it, but we didn’t actually see it), no stickers this time. Consequently, our map is a bit of a hodge podge and people may wonder how we got to certain places. Anyway, like I said, everyone is different on this question, but when I claim a state, I like to have at least one specific memory I can associate with it. Oh, and we were also tempted to count it when we passed through Pubelo, Colorado. I was wracking my brain on why that sounded so familar when Lee reminded me most government publications came out of there when we were kids. 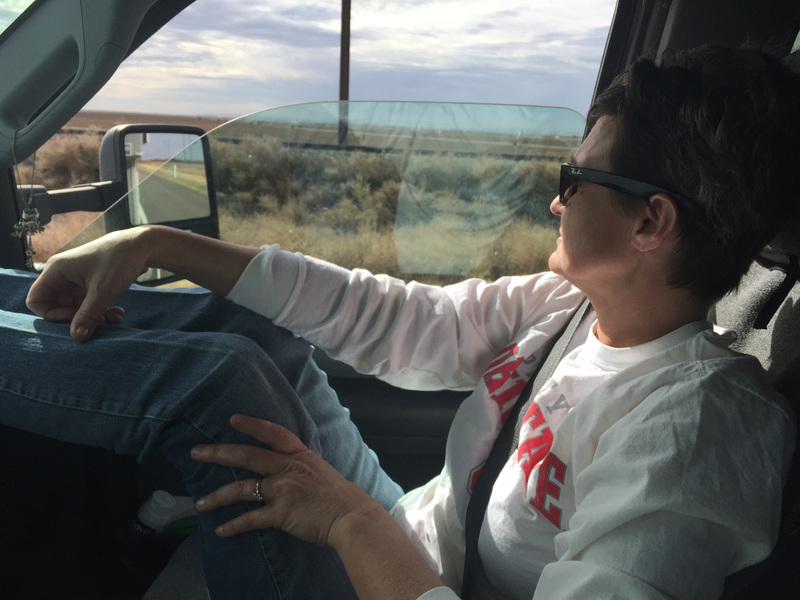 Remember the commercials “Write to PO Box…Pueblo, Colorado.” I love it when we actually get to see a place that I have heard about my whole life. Adds a certain zest to the experience. OK, back to the story. We crossed into Texas and were headed straight to Amarillo. We like this town and in particular we like The Big Texan restaurant which we both think is the best steak restaurant we have ever been to. 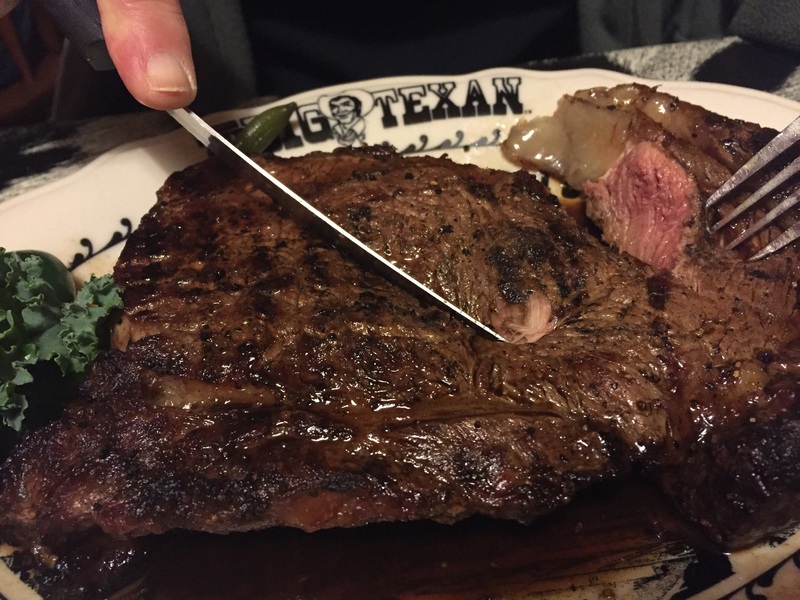 This is no small claim as we have eaten many steak dinners in many places over the years, but The Big Texan (who has their own herd of cows) is really, really good. The last time we came through here, we did all kinds of fun things, but this time it was just a steak dinner, a night in the Amarillo Ranch RV Park, and then on to Sweetwater. We did have a chance to drop off our friends Deb and Steve’s Big Foot trackable in the geocache at the restaurant. We “rescued” it in Alaska and since he had a hankering for international travel, thought a tourist destination was a good place to drop him off. 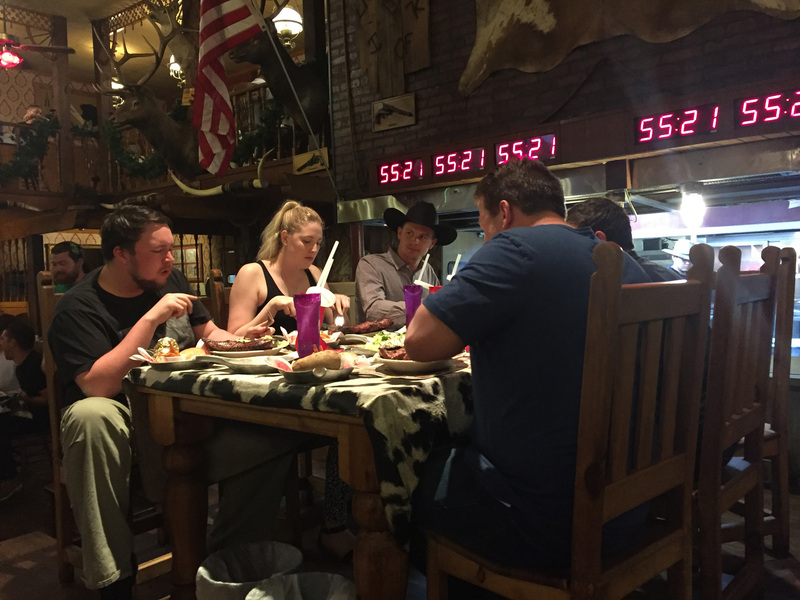 It may have been a good call, because while we were at the restaurant a huge group of Australian kids came in and five of them competed in the 72 oz steak challenge. The way it works is you have one hour to eat a 72oz steak, salad, roll, 3 shrimp, and a potato, and you get the meal for free. 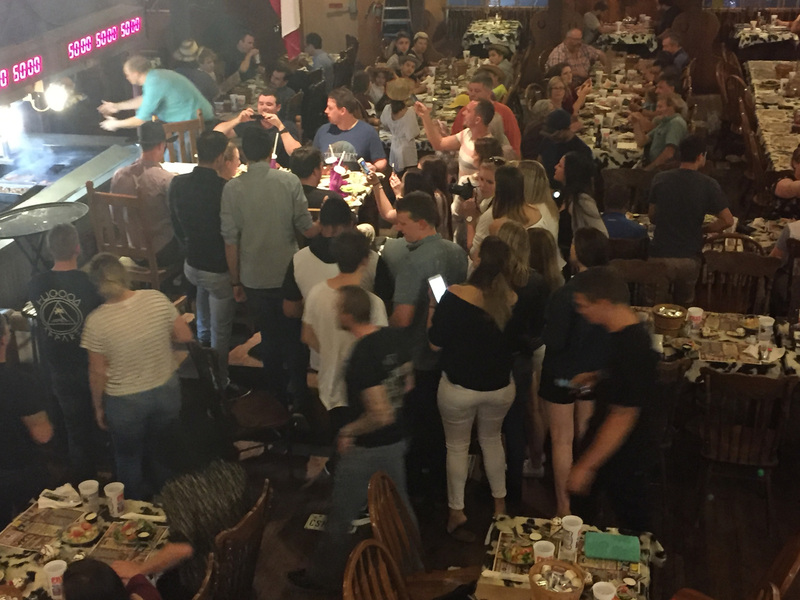 The steaks are BIG and it’s fun for the other diners to watch people try. Those Aussie kids looked like serious competitors, and although we didn’t stay to see how it ended there’s a good chance at least one of them completed the challenge, and who knows, maybe one of them picked up Bigfoot on the way out. I would like to say here that if you have never been here, Texas is an RV friendly state. There are RV parks in almost every city, the roads are straight and pretty well maintained, with lots of state rest areas, and the gas prices are generally some of the lowest in the US. 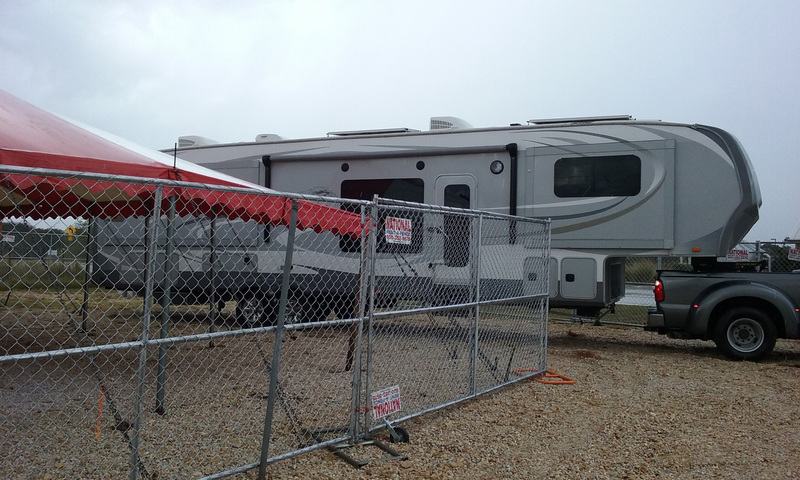 The weather is also warmer (it went from overnight 40’s in Colorado to 86 in Texas in one day), and since there are lots of RV’s there are also lots of services. It’s not our home state, but I can understand why many people have made it theirs. Even though at first glance we may not feel comfortable (we are non-gun owning liberal Yankee democrats after all), we never feel that way. My rule of thumb when traveling through here is don’t mess with Texas and everything will be fine. I am sure those who live here would agree. 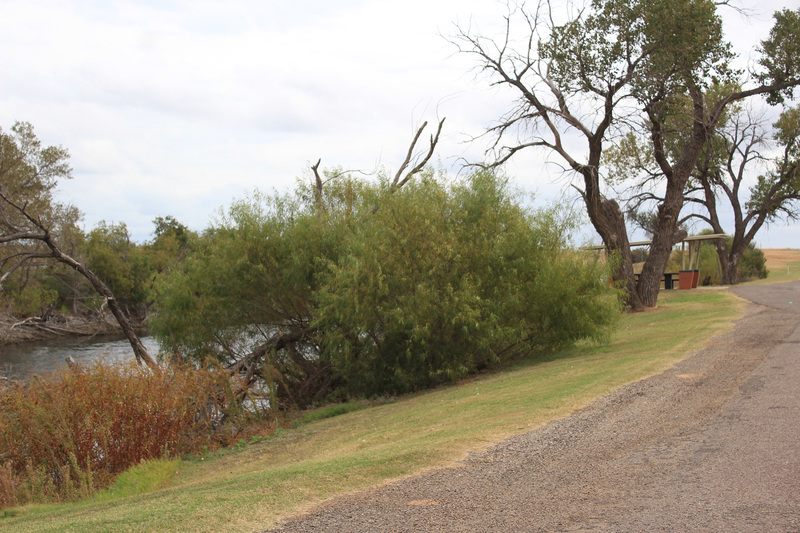 The next day we started at 9am and landed in Sweetwater, Texas at the Bar J Hitching Post RV about 3pm. On the way we passed through Abernathy and saw the cotton harvest in process. 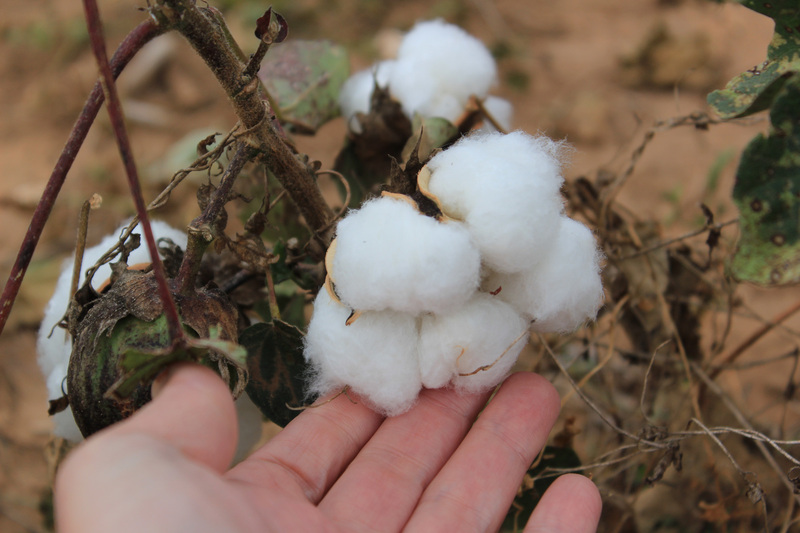 I don’t think I have seen professional cotton growing this close up before, and took some time at a rest stop to walk over to a field and take a few pictures. I am endlessly fascinated with the different crops grown in different parts of the country and after seeing close up what it takes to harvest and process the beet crop, was very curious about the machinery that harvests cotton. There were huge bales of the stuff in several farms and it didn’t escape me that 150 years ago this process was completed by slaves and is now being done almost exclusively by machine. Progress is not always a bad thing. 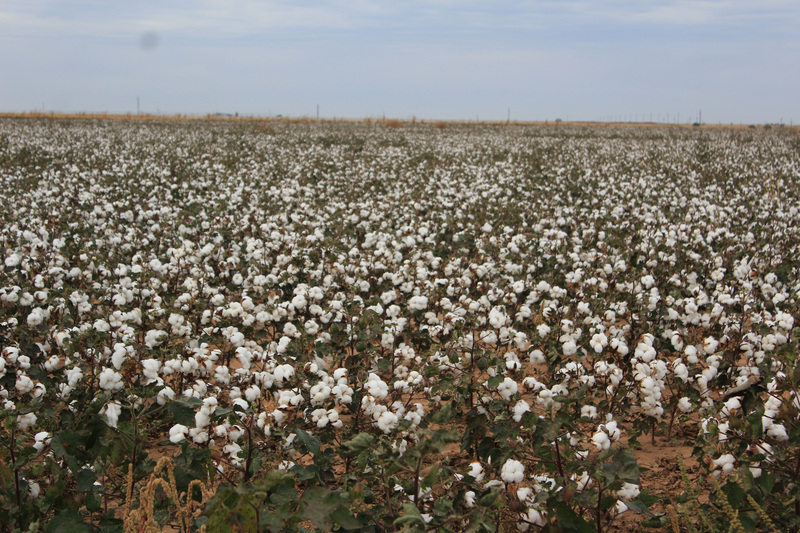 Plus I have seen clothing with cotton from Abernathy, Texas so once again seeing where stuff comes from was cool. By this time we were both getting really tired. No real time off after the beet harvest combined with long travel days and another time zone change were taking their toll. Plus, I was starting to get anxious about the Christmas Tree job. 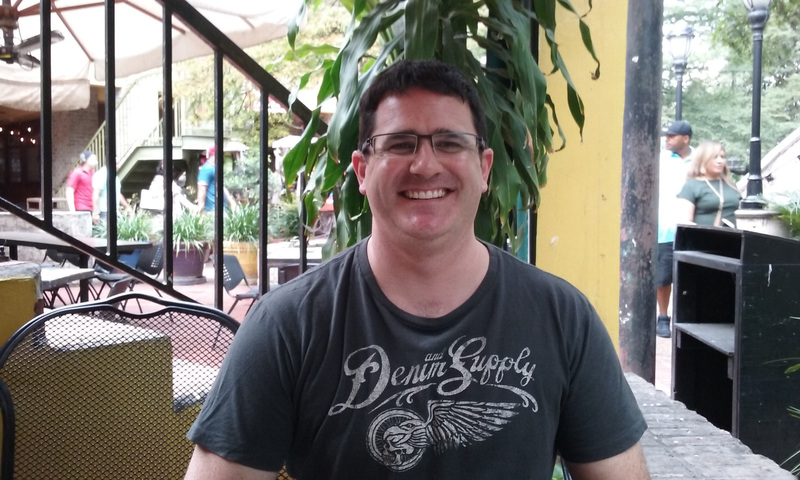 When I first signed up, I was really focused on the work itself and the compensation. The job sounded really fun, the money seemed fair, and the timing was perfect as we had a non-revenue generating hole in our schedule. Add to that it was near where Cori and Greg would be and perfect! What I never really thought about was the fact we would be staying in a parking lot for 2 months. Now for many people this might not be a big deal. Many people camp in parking lots frequently, but our first two experiences (Walmart and Cracker Barrel) were a mixed bag. We disliked the experience enough that in two years we have only stayed overnight in parking lots three times. Compare this to our friends Bill and Kelly (who frequently stay in Walmarts, Cracker Barrels, Moose Lodges, etc on travel days) and we know we are definitely not the norm when it comes to this. So here we are, the people who never stay in parking lots signing up to live in one for two months. How did this happen? Well, I blame Lee. When I look for jobs for us, I generally focus on the particulars of the work and Lee looks more at living conditions. He worries about 50 amp and hookups and all that stuff that really matters, but I tend to wave my hand and think it will all work out just fine. Lee knows better. So I am not sure now how the fact we would be living in a parking lot got past him. Yes, it’s necessary to complete the job assignment, and yes, we will have water and electric hookups, but still. Is it possible he’s mellowing? Can I no longer rely on him to be the voice of reason when I get these crazy ideas? In either case, I am nervous, and nothing short of getting there and seeing the setup is going to solve that problem. At the core of this I think is I really need a few days of rest and I am not sure how restful (for us) a parking lot could be. Time for some more personal growth, I suppose. I hate that. Well the only way to to find out was to get there, so after a night of mostly rain we drove towards New Braunfels. We don’t mind driving in the rain, but as Lee said “It’s not pleasant”, still there is rain and there is rain. Pretty early on the heavens opened up and it POURED. Now Texas roads are nice and flat, but they also tend to flood in sudden rains, so pretty quickly we were driving on roads where the low areas had standing water on them. You can’t hit those at 60 mph, so there was careful watching, changing lanes, and using flashers and slowing down in certain points. It was pretty tiring for Lee, so I took over around 10:30am and drove until 1:00pm when we took a lunch break and switched back. It wasn’t constant as the storms was moving east to west and we were traveling south, but that almost made it worse as it took forever to finally drive out of it. Finally when we were close to our destination the sun broke through and we were excited about finally being on dry pavement. The company we are working for was sent Greg to meet us at the lot to meet us and we had kept him updated as we traveled, but unfortunately he was delayed by an accident as well. We couldn’t wait at out lot (I’ll explain why in a minutet), so we waited at a nearby truckstop, and of course right when he arrived, it started pouring. Great. 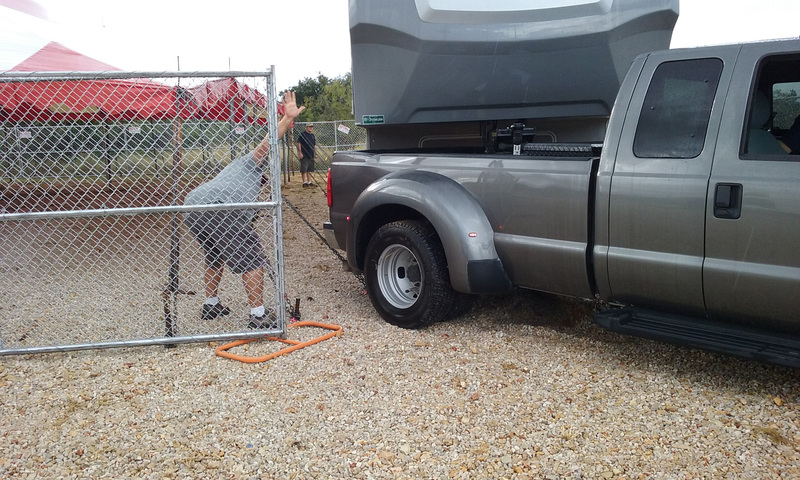 Greg told us it was going to be a tight fit and now we were backing in in the rain. Despite the conditions I was absolutely sure it would work out (my optimism had returned) and Greg and Lee not so much, but what choice did we have. Our site it turns out is one of the newer ones (only it’s second year) and was on the outer edge of town. It was next to a corner gas station, with a carwash, but the only way to get to the lot was drive the rig through the Shell parking lot and into the gravel lot next door. Since the tent and the fencing was already up, it would require two 90 degree turns. Will (and John, one of the fellow work kampers) jumped right out in the rain and I wisely decided to let them all handle it. I grabbed an umbrella, and basically got out of their way. I have quite a bit of experience backing Lee in at this point, but not in a situation like this. Let me just show you the pictures. What’s really great is the rig is in the back of the lot which is on a residential street across from a fire station and next to that a piece of undeveloped grassland. I was super relieved by the fire station presence. Yes, we may get the occasional loud siren, but we weren’t surrounded on four sides by busy street. Plus since our bedroom is in the back, instead of having the floodlights of the carwash in our bedroom window, we had the relatively dark lot next door. Really felt lucky about both of those things. I am going to post more pictures in the next post (these were taken with my camera under an umbrella in the rain while I was on the phone with my friend Kelly so frankly I am surprised they came out this good, but it’s enough to give you some idea. 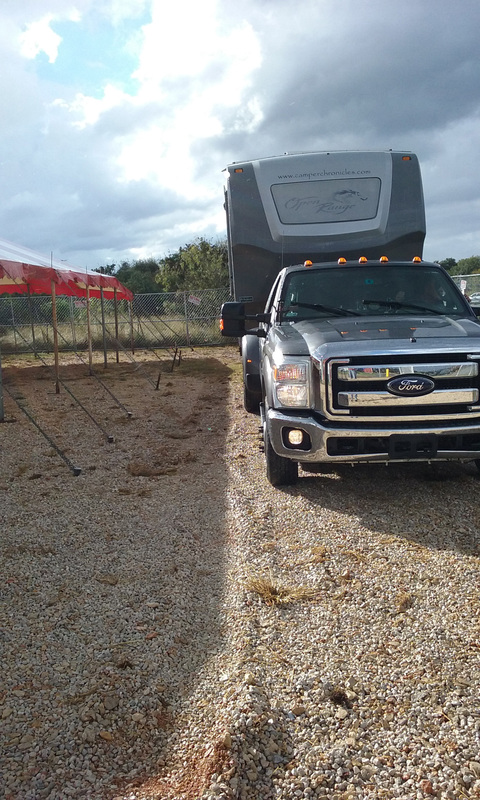 The tent will be empty until November 15th when we start to get trees, and we have some camper re-positioning to do, but we are here and it’s much better than I thought it would be so far. Awesome! 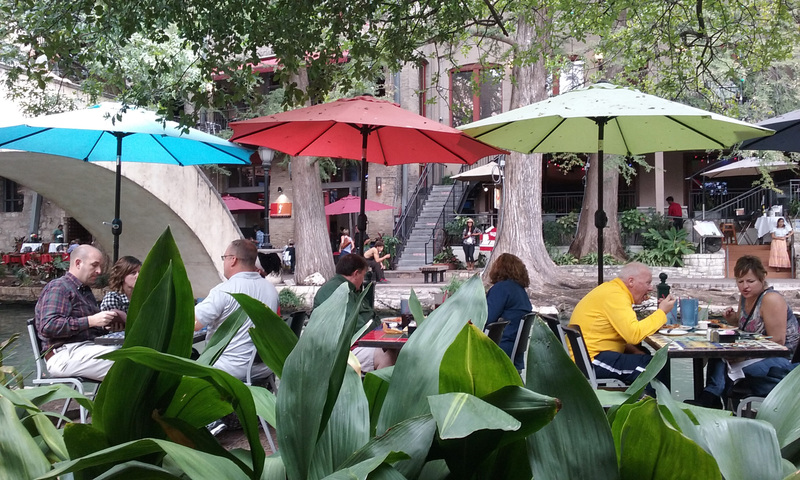 Oh and in a truly wonderful moment of travel serendipity, I got a text from my brother and he was in San Antonio for the weekend and wanted to know if I was free for lunch on Friday. This is why I believe in a higher power, by the way. We arrived on Thursday, start training on Saturday, and the only time I had free was Friday. 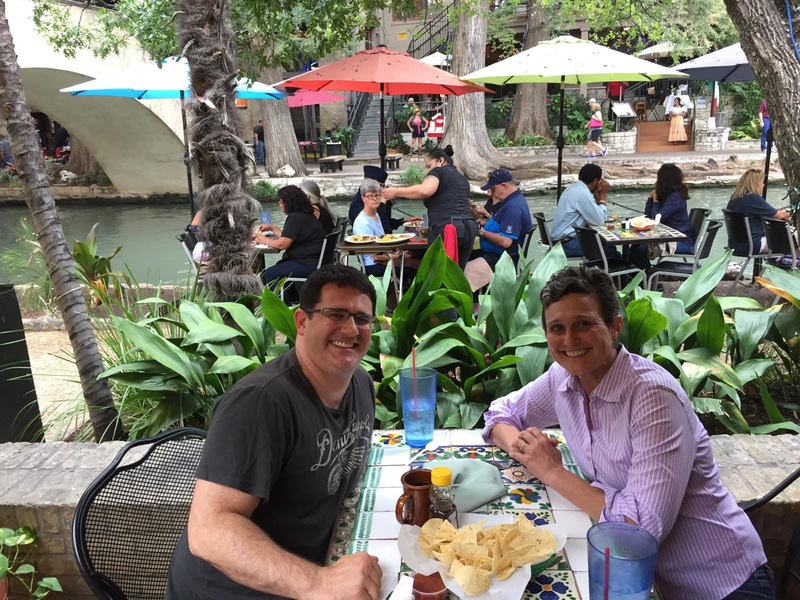 He had never been to San Antonio, had tagged along for an educational conference his wife Patrica was attending, and had no idea I would be in the area until my mom let him know we were going to be in the same place. Eddie lives in my hometown of Columbus, Ohio and I haven’t seen him since we stopped in Columbus on our way to Alaska. We met at the River Walk (super proud of myself for getting the monster truck in a downtown parking garage) and had a great time catching up. 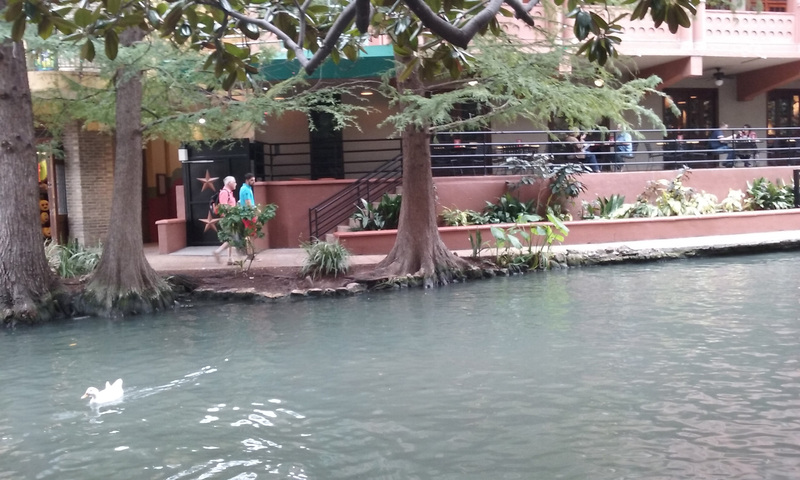 I love the Riverwalk (wrote about it two years ago when we came here for Kay’s Air Force graduation) and we ate outside at one Mexican restaurant and then moved to a second to get the sopapillas I wanted for desert. My brother did a lot of traveling when he was in his 20’s and even though he doesn’t read the blog has stayed somewhat up to date on what we are doing through my mom. I was a little worried about what he would think about everything, but he was super supportive. I was particularly touched when he said he was talking about me on the plane ride out to a guy sitting next to him, and the man (who was youngish but had just sort of retired), was incredibly jealous. The guys said he totally got how appealing it would be to “chuck it all and just sell Christmas trees for awhile”. Wow. So here I am, feeling nervous about my choices, and God/the universe sends me some validation through some random guy my brother met on a plane. Yep, I don’t believe in coincidence at all. 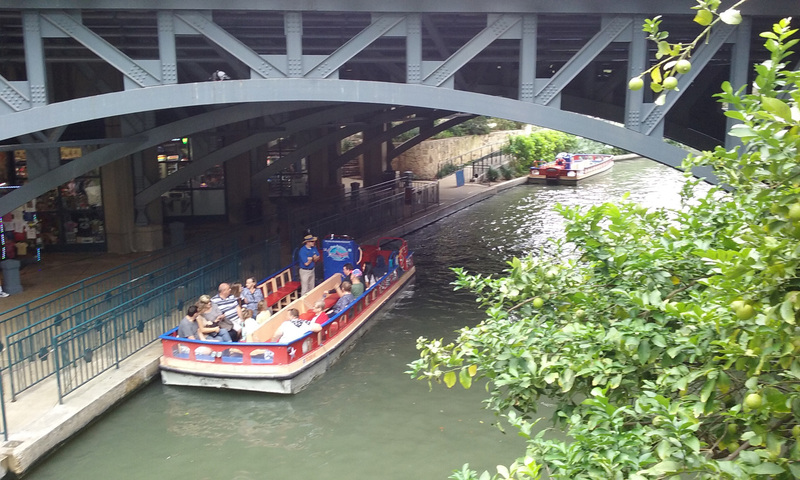 The boat tours are great, if you ever have a chance to come here. Eddie and me. I look pretty good for a 50 year old chick that just finished a beet harvest! It was a wonderful surprise and a much needed boost of affirmation from someone who has known me my whole life. I’d love to say that I have everything figured out and I never have doubts, but that would simply not be the truth. I have moments, especially when we are doing things that are none of our full timing friends have done before, let alone our long time friends and family when I think we have strayed too far outside the norm. The reality is though we are creating our own normal. It’s pretty exciting, since we get to make up the rules, but also sort of scary since we have no idea where our personal boundaries are until we run into them. Thankfully we are doing this together and have absolutely fantastic support from our friends and family. It’s humbling how much faith they have in us that it will all work out just fine. Sometimes, I just need to remind myself of that. 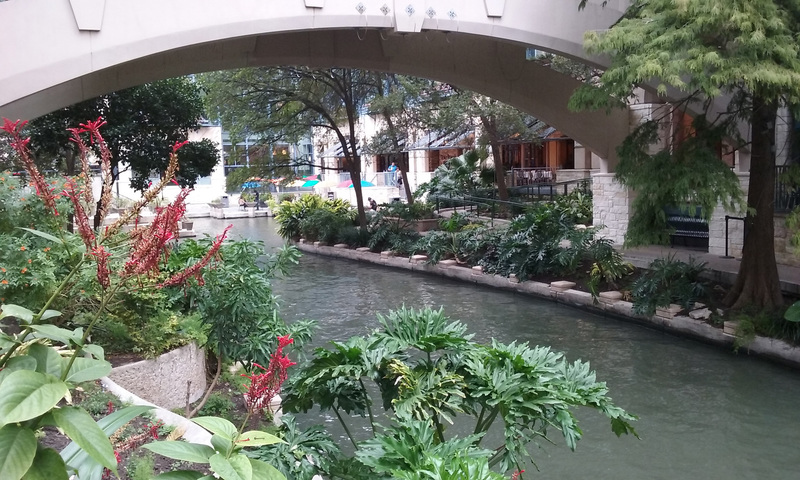 This entry was posted in Lakeside and tagged Amarillo RV Ranch, Riverwalk, San Antonio, The Big Texan, Travel Serendipity, Work Kamping on a Christmas Tree Lot. Bookmark the permalink. Sounds like another exciting adventure. We always made picking out a Christmas tree a family event and have many fond memories. I would think most of the people will be in the holiday spirit while shopping but I am guessing there will be a few Grinches as well. Cannot wait to hear about it! 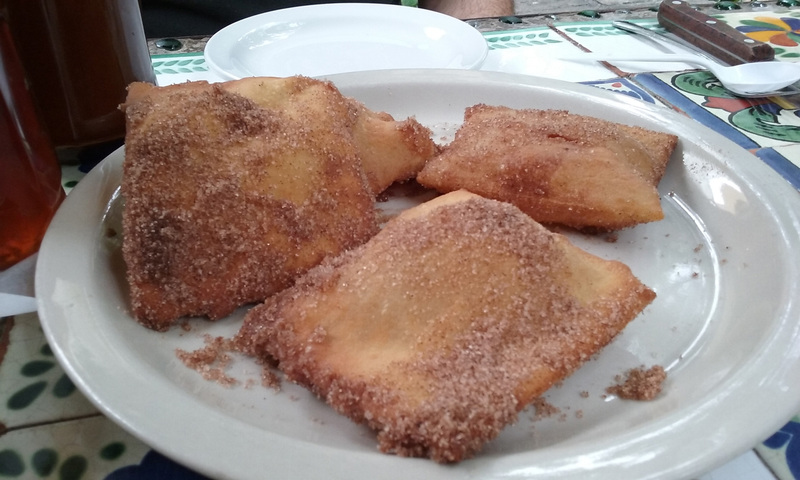 You just made me home sick, my mouth was watering over the sopapillas! Lee, “mellowing out”? Enough of this crazy talk. Welcome back to Texas! We are glad to be back here for a few months, humidity and all! We are just getting off a “Texas honky tonk” trip here in the hill country. Have fun with the trees! I didn’t mean to put Michigan at all. I am only going there under serious protest being a bUckeye and all!! Glad you guys made it safely to your next job! I know what you mean about the overnight stopovers, but instead of WalMart or Cracker Barrels, we’ve been seeking out casinos more frequently lately. Our first year we had several Wally Docking experiences, but happy to say we’ve only had one in the past 12 months, YAY!! In fact, writing this while overnighting at a casino in So Cal. RV parks here are soooo expensive and for a one night stopover, arriving at 6 PM, this worked perfectly for us. 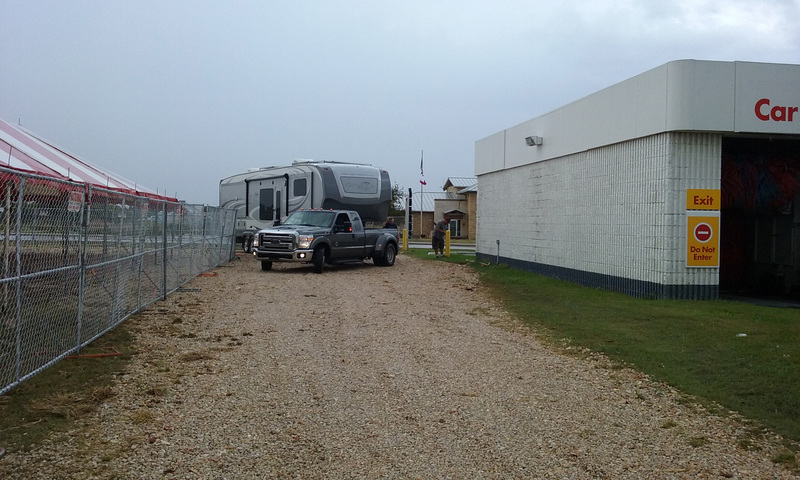 Trucks are in one section of the RV/Truck lot, RV’s in another section so the noise from the trucks is minimal. We do have highway noise, but that’s what our white noise machine is for at bed time. We definitely want to try that soon. People talk about the great players card deals they get and that sounds like a great perk. Is there an app you use to find the casinos?? We agree casinos are the best. Allstays will find also casinos, shows up as a purple color with CP in the center. Gene’s answer is the same as mine. Rules for each casino vary greatly, how long you can, required to join Players Club etc. We primarily use them for either enroute one night stopovers or when we need to be close to a city right before or after an art show and we just need to park and work for a couple of days. One lesson we learned, from mid-June thru July 4th, not a good idea to be there if it’s on Reservation land where fireworks are sold. Every night sounded like a war zone when we stayed for 3 nights in late June one year. Scared our kitty and interfered with sleep. Glad you made it safely to TX! And – thanks for being on the phone while Lee backed in! Does look like a challenge, but he’s a pro now! Love that you got to see your brother! That’s awesome! Can’t wait to hear how this job goes!